Inferno is a 3D film-noir!??! This movie is filmed in 3D, a very popular thing in the early 50’s and 20th Century Fox was a little late to the game. This was their first film in 3D and didn’t come out until 1953. This has film noir great Robert Ryan playing a millionaire that is abandon in the desert and left for dead. He has a broken leg and has to survive on his own with very little water and food. We also have frequent femme fatale Rhonda Fleming as the wife that leaves her rich husband in the desert to die. Her motivation for doing so, is falling in love with the desert guide 3 days before, played by William Lundigan, and a circumstance where her husband falls from his horse and breaks his leg. This is written by Francis M. Cockrell who wrote a lot of crime and thriller stories for the big and small screen. Inferno is directed by Roy Ward Baker who directed many crime and horror projects for movies and television. Our hero’s thirst for survival is based on his need for revenge on his wife. We almost have 2 films here, the survival story of our hero and out femme fatale covering up the murder she thinks she’s committed. Both come back together for a final conclusion in the end. This is not a traditional film-noir, being filmed in color and 3-D, with stereo sound to boot. The effect is well done, with the beauty of the desert setting and Fleming’s red hair and blue eyes popping in vivid Technicolor. I watched this on television so I didn’t get to watch this in 3-D. 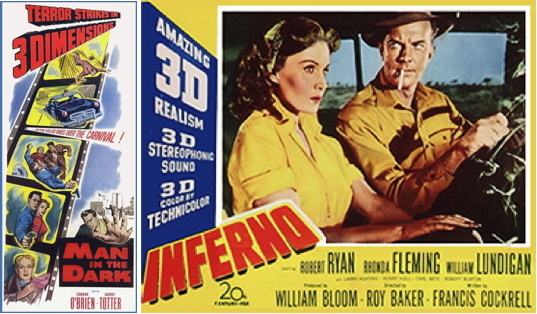 There was a few of these 3-D noir films made in the 1950’s, it would be cool to see these released on 3-D Blu-Ray. This is not a widely viewed film with under 600 viewer ratings on IMDb. I actually think this would be enjoyed by a wider audience then just crime and noir fans. I think the outdoors enthusiast as well as western fans may enjoy this as well.